"The Asus Eee PC 1201K is a 12 inch mini-laptop which looks a lot like other Asus notebooks such as the Eee PC 1201N or Asus UL20A. 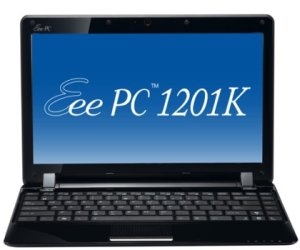 But while those machines have Intel chips, the Eee PC 1201K has a low power AMD Geode processor." I may not have been paying much attention to the CPU market lately, but it has been a long time since I have seen the Geode CPU in consumer electronics. My last experience with a Geode based computer was probably close to a decade ago, though I recall some mobile UMPCs making use of them. I have to wonder about the timing of this release though, as AMD's Bobcat is not that far away, and will probably offer far better performance per watt compared to the aging Geode platform. Even if the 1201k was available in Canada, I cannot say that I would find it that tempting. I would much prefer an Atom or Athlon Neo based setup.